Process mascarpone with egg yolks and sugar in a food processor until smooth. Whip cream until soft peaks form and fold through the mixture. Carefully wash and dry the beater, then beat the egg whites until stiff peaks form. Fold through the mascarpone mixture. Fold in the amaretti crumbs and the hazelnuts. Wash and hull the strawberries, cut into halves, quarters if they are very large. Wash and dry the blueberries. 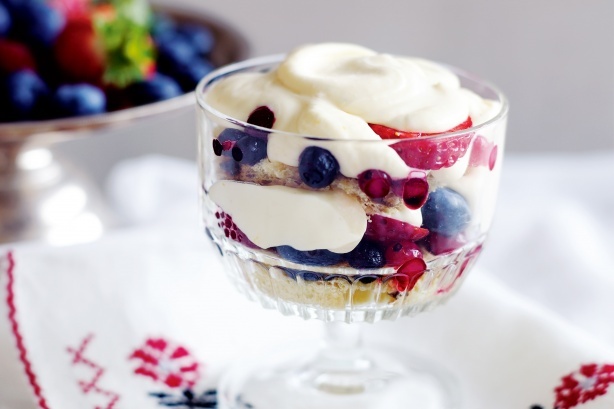 Arrange alternating layers of mascarpone and mixed berries in a glass serving bowl, finishing with a layer of the mascarpone. Do this carefully, as the dessert looks spectacular through the glass. Chill well. Decorate the top with a wreath of berries and scattered almonds slivers. To serve, place on a large serving platter and surround with almond Christmas wafers.